This one is for show, you can fly and use the weapons, recommended to press X shortly after take off for effect, but it's not necessary. "Bliterator 2" - tricopter VTOL demonstrating proper, highly responsive helicopter controls with no hover-bug. Keep [Shift] held - lean and turn to descend. Make quick 180 turns (pulling back). Skim the ground, be daring. The control system, using two limbs of hover steers, is based on that used by @Rockfarmer. A 'fulcrum' design, that looks weird, but works really well with TT's controls. 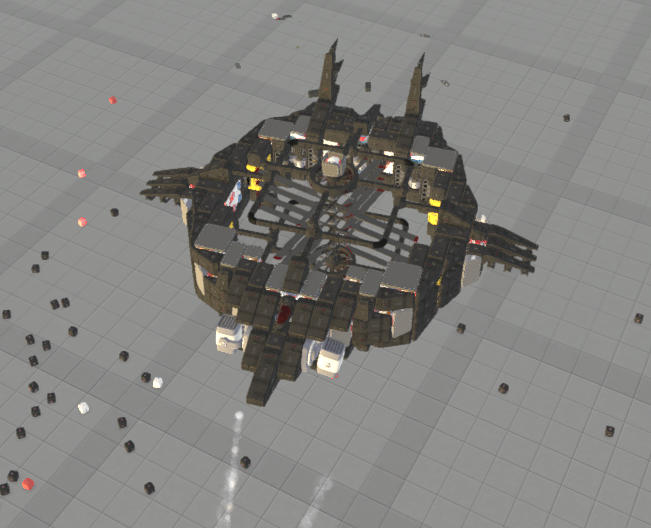 This tech evolved from my previous recreation of @Chrii_the_Vieh's entry into this VTOL competition. They have a little extra forward force from a propeller, which makes them more fun to fly around. Last year I made a whole collection of "VTOLs that fly well", here on Steam, to show of the possibilities, given that many were considering it impossible. Guardian: A relatively tanky AI drone equipped to generate power and distribute it to allied techs. Set to defensive and have it follow or take direct control. Minnow: A non-standard airship with near neutral buoyancy. Shift to go up and forward. W to angle down, S to angle up. A and D for turning as normal. Cricket: A mainly Hawkeye jump assault tech. It has vertically aligned thrusters to allow for limited flight. Drive as normal. Press shift to go over obstacles. Allows for limited flight controls in the air. Herald: The Herald is a non-hoverbug helicopter using the experimental hoversteering and gyros. Shift to fly, WASD to move. Anyways, I've just grabbed some not-very-old techs and placed them in a save. Flying Stuff: Fly around. If you want to, head back to spawn to fight enemies. idk i just build something, its name "idkhowtonameit"
the thing i'm working on is not only too many techs for it to function according to the rules, but also it'd probably kill the stream as well. LOAD R&D SAVE IN 1.0.0.4.WATCH TECH AUTOMAGICALLY ORBIT YOU. USE OTHER TECHS TO TAKE A CLOSER LOOK IF NEEDED. It is programmed to move in an orbit around the tech in the save. You can change the settings by adding, removing or moving the resources on the conveyors. Snapshot in spoiler for your own use. LOAD R&D SAVE IN 1.0.4.WATCH TECH AUTOMAGICALLY ORBIT YOU. USE OTHER TECHS TO TAKE A CLOSER LOOK IF NEEDED. Why not submit it and I we make a call before the stream? I'd intrigued to see what you've got! it's gonna be a 9-part MT hovership, don't you think it would kill the game? Preferably charge up before testing. Press Shift to Boost. The Bolien CTAV (central thrust assault VTOL). *slaps roof of Bolien* this bad boy can carry 6 cruise missile and 2 GSO missile launchers. The advantage with the Bolien as opposed to a helicopter-style VTOL is that the Bolien doesn't tilt, it just sits calmly in the air while it rains down death. To ascend, press shift. To move around, use normal WASD controls. Charge before flight. Here's a last-minute tech: the mighty Metal Mastadon, a marvellous machine to make mincemeat of marauders and malingerers while maintaining maximum multidirectional motion. It is designed for missile broadsides while circling enemies at speed. It can still pepper them with bullets, of course, and attack head on. Thanks to everyone who submitted their techs for this week's Comm Core. As is tradition, I'm now locking this thread! Check out twitch.tv/terratechgame to see all these, and more, in action!